Mix the yeast, salt, eggs, honey and melted butter with the water in a 5-quart lidded (not airtight) food container. 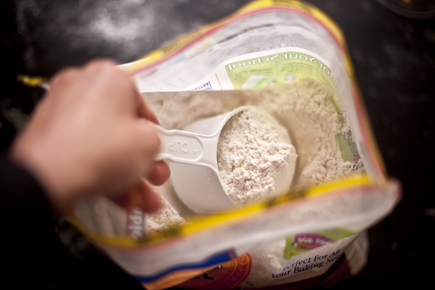 Measure the flour using the scoop and sweep method. This is made even easier if you put the flour in a container or use the Gold Medal flour that is in a plastic bag, which has a larger opening than the traditional paper bag. Use a spoon and mix until all of the flour is incorporated. Cover (not airtight), and allow to sit at room temperature for about two hours. Refrigerate the dough and allow it to thoroughly chill before using it, at least 3 hours, but overnight is best. 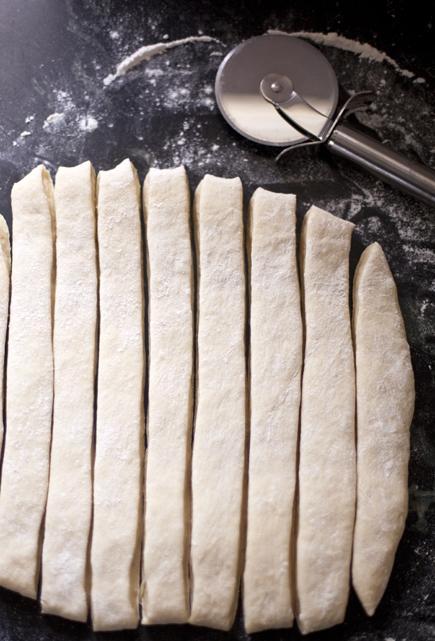 Remove a 2-pound piece of dough and roll out to 1/4-inch thick rectangle. Using a Pizza Wheel, make 12 even sized strips. 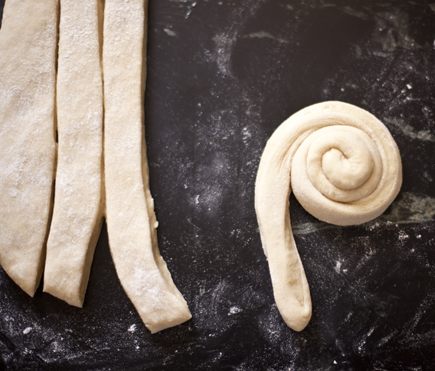 Coil the dough to make flattened spiral bun, tucking the end under the bun. 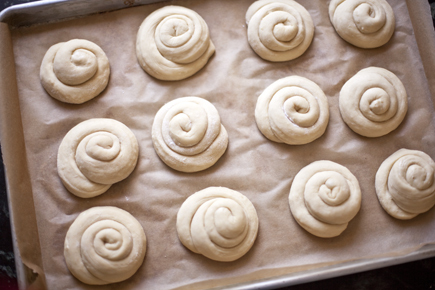 Place the buns on a Half Baking Sheet lined with parchment paper. 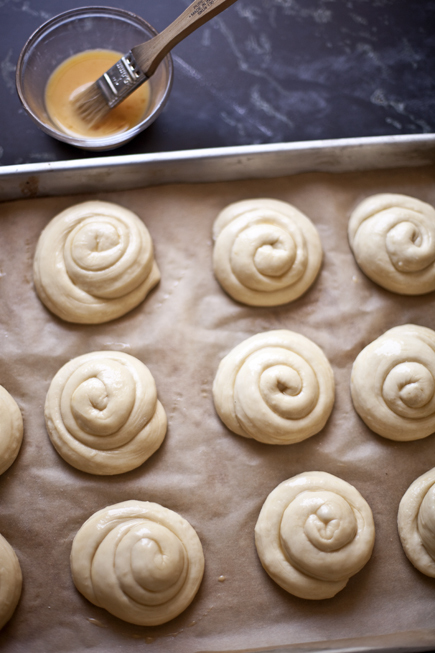 Cover loosely with plastic and allow the dough to rest for 45 minutes (the long rise will result in a softer bun). Using a Pastry Brush, paint the top with egg wash. Bake for about 25 minutes or until light golden in color and the top of the spiral is firm to the touch. Allow the buns to cool. 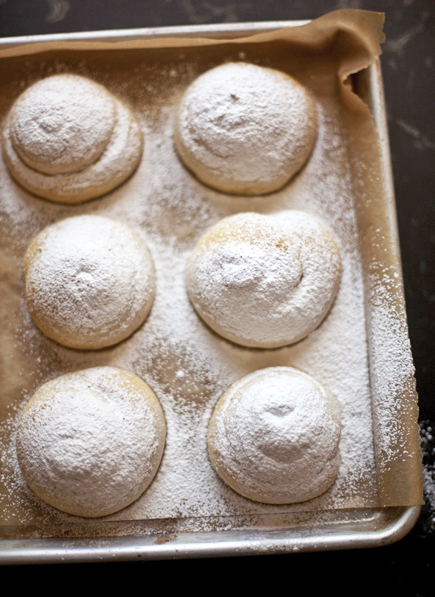 Sift a generous layer of powdered sugar over the top. Enjoy for breakfast with coffee or split it open and fill with your favorite sandwich stuffing. In Puerto Rico they pan fry them in butter, which is delicious. They also make a great after school snack. These look wonderful. My husband insists that I always have a brioche dough ready so I will try these soon. I sure did and they were awesome! The texture of those breads is much lighter than our breads, which tend to be heartier. I use to leave in Puerto Rico from 65-72 and completed my last year of High School. I loved many of the foods, Pan de Agua my absolute favorite, along with lechon, arroz con pollo , rice and beans and of course Pan de Agua. I have never found anything like it. Pan de agua is one thing husband and I always searching for. We had pan de sabao for the first time last trip with a huevo, queso y jamón sandwich. these were made w/ bleached flour? Yes, I made this batch with bleached flour, but you can do the exact same with unbleached. Why AP flour and not bread flour? I want to make them so the crumb is really gooey. I have seen mallorca recipes with bread flour. Can you explain how they would be different with bread flour? 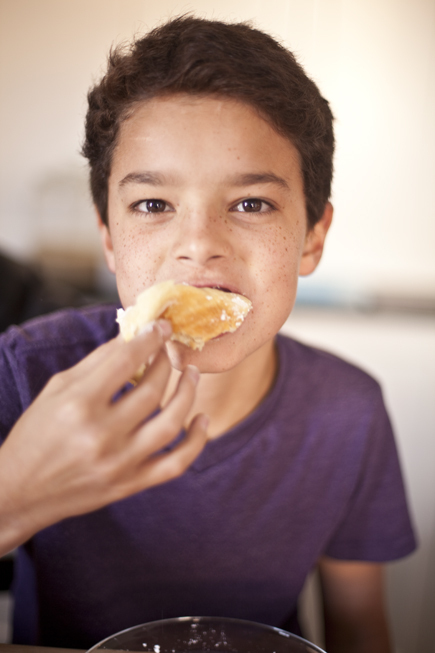 We use AP flour because that is what most people have in their pantry. If you want to use bread flour you will have to add a bit more water, since it is higher in protein and will absorb more water. The higher protein means there is more gluten development, so it will have a bit more structure. I’m not sure you will find much of a difference for this recipe, but it is worth a try. 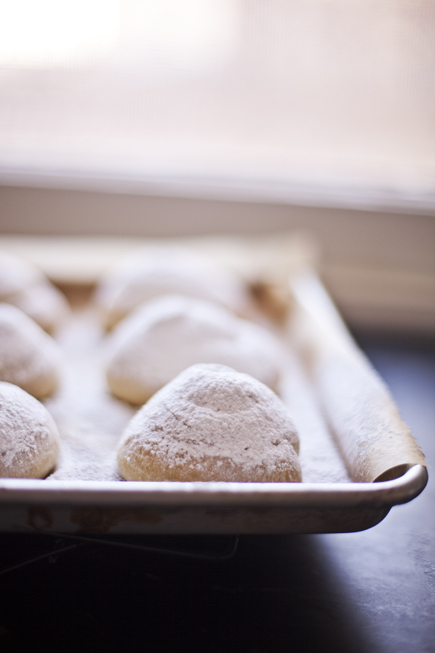 Please share your Pan de Agua recipe with us! I am from Cuba originally and love the cuban bread which I guess is like the Pan de Agua! Thanks! Is it bad that I came to grab the master recipe off the blog here. (lent my sister my book, then moved to colorado with out it…Guess I’m not getting that back) and wound up promptly making this instead? Or is it worse that I had enough honey and butter to produce this without even making a dent in my stash? Oh well, breakfast is started for tomorrow! well, everything in moderation, including moderation! These are fab! How can I keep those not eaten for the following day? Wow! These are wonderful! I’m wondering what is the best way to store leftovers for the following day? Thank you! our stuff’s best fresh, but you can freeze (wrap well), or just put in a plastic bag. these will stale quickly if left out. I am curious to know about the exact temperature this bread to bake in the oven? I have my mixture ready and waiting for tomorrow to bake. Waiting—- thank you. 350F– it’s in the text of the post, above. I noticed that these are rolled individually instead of rolled into a log an sliced, like cinnamon rolls. What is the difference in the finished product? Would it look different if rolled and sliced, or is there more to it? it’s going to peak more in the center this way, but your way will work and also produce a nice result. Just won’t look like a snail! These look tasty and fun to make. You mention that they are pan fried in butter in Puerto Rico. Do you mean instead of baking them in the oven, they pan fry the raw dough in butter? you can fry bread dough that way, yes. Keep it thin. I’m Puertorican and never had these when I lived there. But I made them for Mother’s Day for dessert for my extended family and they loved them. I just made a batch this weekend and they are all gone already and I’m getting calls from my inlaws to please make more for them to take to work for breakfast. Thank you so much. I love trying new things and bringing healthy to my 3 1/2 and 2 1/2 yr. old boys. I don’t know where you lived in Puerto Rico, but if you did’t know the mallorcas, definetly, you are not puertorican.. Not a chance, unless you live in a remote town!!! I absolutely love slightly sweet breads but many of them call for honey which is a flavor that I am not overly fond of. Can I substitute anything for the honey such as light molasses or real maple syrup or anything really that will give me the sweetness in a slightly different flavor. How do you feel about agave syrup? It has a more subtle flavor and substitutes perfectly for honey. I made these and found them delicious I like the bit of sweet from the honey. Really good. I visited PR a few times but didn’t go to the bakeries so I never had them. I love your books and have them handy all the time and I don’t buy bread anymore for anything. I make all my own and have a fresh batch perculating in the fridge right now. I wish you would give the weights as well as the measurements. I have no luck with all the different ways of measuring flour. Weight is always reliable. I’m going to try one of all your marvellous recipes. I used to bake bread donkey years ago, before I had my children; and work, family, everything just seemed to take over my life. But being able to prepare the dough in just 5 min and then bake the next day sounds really attractive to me. Before I used to spend a whole morning and afternoon to do it, not to mention the washing up. I notice that in some recipes, you have melted butter. I am trying to reduce the fat my family eats. So can I just replace the melted butter with olive oil? Or sunflower oil? I tried to make this dough last night and obviously I did something wrong…I used unbleached flour and let it sit out about 3 hours then put it in the fridge overnight. The dough looks nothing like the picture above, it has lots of lumps and is too sticky to roll out/handle. Any suggestions? 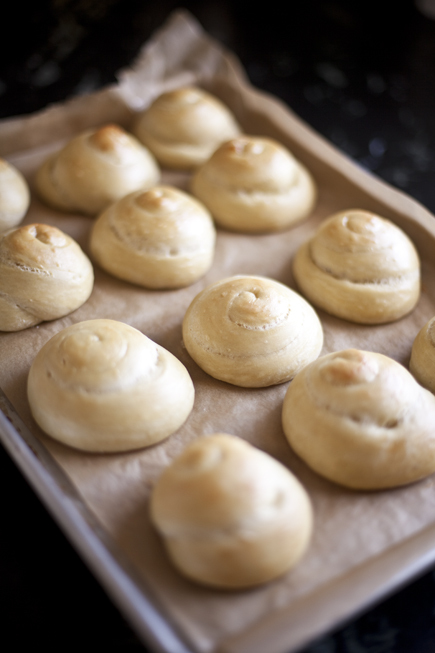 Found the video about Brioche…it was very helpful and I am going to attempt the dough again. 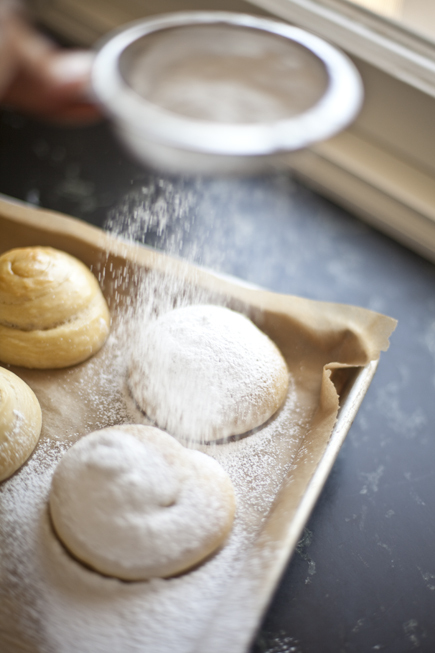 These “Mallorca buns” real name is ENSAIMADAS, they are originally from the Balearic Islands (Spain). The traditional recipe is quite simple: flour, eggs, sugar, lard (NOT BUTTER), yeast, milk and icing sugar. You can have them plain or stuffed sweet (caramel cream, chocolate, cabello de angel-pumpkin jam, etc) or salted (sobrasada is the most traditional). ¿Mallorca en Puerto Rico?. Ahora me entero. Creo que toda la vida ha estado en España. No may, surely the origin is Mallorca-Spain. There are documents that already mention them in the XVII Century. Remember Puerto Rico was an Spanish colony. I made these rolls for my food day in my Spanish 4 class. Although the dough didn’t rise a lot, they got bigger in the oven and filled the house with a wonderful smell. I then paired them with a Mexican coffee. They were a big hit and I got an A!!! Thanks for the wonderful recipe! Maravilloso! Possibly just needed a longer rest before the oven, but what you saw is a truism about our doughs–they get more of their rise from oven spring than from “proofing” before the oven. True, I did rush the rising process a bit. Plus, they were gone in a matter of minutes, so I am not complaining. Thanks again!!! My name is Karine and i live in France. I like your blog and good recipes !!!! I had eaten those buns in Mallorca, it was so fabulous. I would like to make some but i don’t know which type of flour you use. Please explain me. I am waiting for your answer. Do you have “plain” and “strong” flours? If so, we have found that American all-purpose most resembles the “plain” flour. I am so glad I found this. I am a huge fan of ABin5, and I was looking for a good recipe for mallorcas. I am originally from PR, and my family and I really mallorcas here in TX. I have some ABin5 brioche in my fridge right now, so I know what we will be having for breakfast tomorrow. 🙂 Muchas gracias!!! I made this recipe for my Farmers Market Business on Sunday and they were a BIG hit. I love their simplicity and taste. Awesome . But I did let them prouf for 60 min. Extra lite and oh so soft . Fantastic, so glad they’re a success and the extra rise is a great idea if you have the time. I start shaping at 3 am for my markets and time gets away from me every once in awhile, hence some extra proofing at times. I just have to say I LOVE your books. They saved my family in our time of need. Thank You! We’re so thrilled you are enjoying all the bread! You can form them, loosely cover with plastic and refrigerate. I’ve left them for about 14 hours in the refrigerator. Just put them on the counter while the oven preheats and they are ready to do in. Thank you so much Zoe!! This will def save me some time in the morning 🙂 I love the book and finding this extra recipe is awesome!! I love mallorcas!